Comedy follows fast on the heels of tragedy in a characteristically wilful moment from Strauss's sparkling opera. In the Prologue of Richard Strauss's Ariadne auf Naxos, the Composer prophesies disaster when he realizes that his opera is to be performed simultaneously with a farcical entertainment. But it's that very juxtaposition of tragedy and comedy that makes the following Opera (the second half of Ariadne auf Naxos) so special. There's a particularly fine example about fifteen minutes into the Opera. In two consecutive movements Strauss contrasts the passion and single-mindedness of Ariadne, heroine of the Composer's opera, with the earthy practicality of Zerbinetta and her friends, strolling commedia dell'arte players. Ariadne, abandoned by her lover Theseus, is suicidal. The clown Harlequin has attempted to cheer her up with a charming little song ‘Lieben, Hassen, Hoffen, Zagen’ (Loving, hating, hoping, trembling). Completely oblivious both to this and to Harlequin’s banter with Zerbinetta, Ariadne expresses her longing for death in the aria 'Es gibt ein Reich' (There is a land). There is an opening recitative-like section (Ariadne singing mostly in speech-rhythms over the orchestra). Strauss follows every nuance of the text as Ariadne dreams of an escape from her melancholy existence. For example, in the first lines, to dark-toned string accompaniment, Ariadne describes the land of the dead, her voice dropping dramatically as she names it: ‘Totenreich’. Soon, however, her mood becomes more exultant. When she describes the god Hermes, messenger of death, the music grows warmer, orchestral textures lighten, Ariadne’s voice soars high and a fanfare-like motif is introduced in the orchestra (this will return later when Bacchus arrives). In this opening section, Ariadne’s mood continues to alternate between melancholy reflection and radiant hope. A sense of yearning increasingly permeates the music – heightened by the constantly shifting harmonies and the fact that Ariadne has yet to sing any sustained melody. Then Strauss produces his masterstroke. The music moves to a warm B flat major, with rich orchestration (proof that a chamber orchestra can sound Wagnerian!) and Ariadne bursts into full-throated, lyrical song. To one of Strauss’s most beautiful melodies, she expresses her vision of death as liberation. She becomes increasingly ecstatic, her voice soaring to a high B flat while the orchestra reiterates the fanfare-like motif. But then she subsides into calm as she imagines her union with the god of death. It is one of the Opera’s emotional high points – we are swept up in the sheer passion of Ariadne’s music. However, the watching comedians Harlequin, Scaramuccio, Brighella and Truffaldino are not used to such lofty emotions. They decide (perhaps with some reason) that Ariadne is too introspective and in need of a good cheering up. Tragic pathos turns rapidly to farce as the music abruptly shifts key, and the orchestration changes from rich-toned strings and woodwind to a somewhat prosaic piano, with light adornment of pizzicato strings, oboe and clarinet. The comedians decide to entertain Ariadne with a dance. Their ensemble – increasingly elaborate reiterations of a cheerful folksong-like melody – is both irresistibly catchy and gloriously funny, as each character strives to outdo the others in dancing and singing. But there’s tenderness here too – the comedians genuinely want to help Ariadne, as does Zerbinetta, who wistfully comments on the attractiveness of the men and Ariadne’s lack of interest in them in delicate coloratura phrases. As the comedians realize that Ariadne isn’t going to pay any attention to them, the ensemble gently winds down in a long coda. Zerbinetta quietly but firmly suggests they withdraw, to leave her and Ariadne to have a woman-to-woman chat. To portray passionate emotion sympathetically and then immediately comment humorously on it seems a near impossible task – and yet Strauss brings it off triumphantly. Taken alone, Ariadne’s yearning might seem too intense for comfort (as the Dancing Master worries in the Prologue), or the comedians’ banter might appear a little banal. Put together, however, they create a sparkling and enthralling mix of joyous humour and profound pathos. What a well written and considered piece. Should have been in the programme? Thank you. 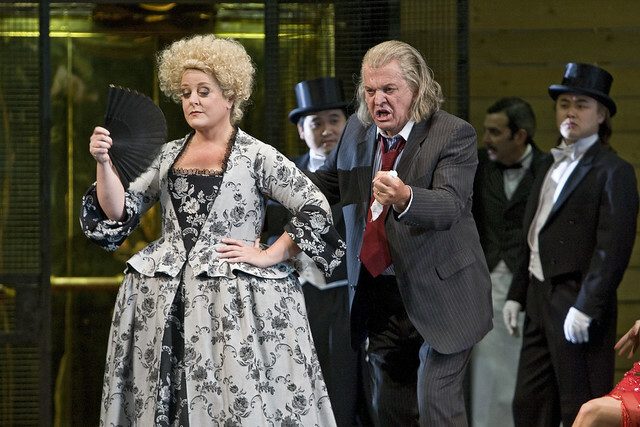 And thanks ROH, for reviving this well loved production of a Strauss masterpiece.